Please note: The next SpiritGroups will form and meet in the Fall of 2018. If you want advance info about those groups, and you do not already receive our email newsletter, please subscribe so we can keep you informed. Unity Spiritual Center of Greater Houston Center has launched a small-group ministry program, called SpiritGroups! SpiritGroups inspire infinite connections, one small group at a time, by coming together in a spirit of love and support. At the heart of SpiritGroups is an innovative approach to linking each small group to five spiritual disciplines (the Five C’s). These disciplines constitute the coherence, balance, and accountability between the various groups and the ministry as a whole. All group members, regardless of a group’s theme, grow in their practice of finding God in themselves, in others, and in their life circumstances. They begin each meeting with prayer, meditation or centering exercise (Communion). All group members, regardless of their group’s focus engage each other in a deep, meaningful manner (Connection). All group members throughout the entire system proactively seek to support and care for each other. No one falls through the cracks (Compassion). All groups are in service to the broader community by taking on some meaningful service project either within or beyond the church community (Community). And, all group members seek to awaken their emotional and spiritual maturity through discussion, study, authentic action and shadow integration (Challenge). Absent of these five disciplines, it is possible for some groups to become indefinite sub-cultures within the ministry. This doesn’t happen with SpiritGroups, as they form and dissolve at established intervals within three major launch windows in a calendar year. At the conclusion of each SpiritGroup interval all groups meet for a community-wide celebration. In addition, and in particular, the SpiritGroups program is appealing to Millennials because the engagement of the small group dynamic is facilitated via a web-base platform. Those interested in a small group can go online from any device to discover SpiritGroups of interest and register for that group(s). These groups work because they are hosted by other Millennials. Video-based content is available that suggests guidelines for discussion and group process. If you are interested in hosting a SpiritGroup or would like more information about this exciting program, please contact us. 1. 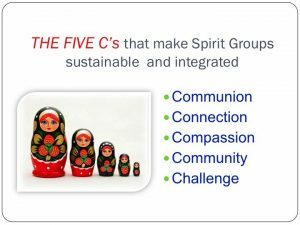 Why join a SpiritGroup? It provides a place for deeper connection with people. It’s a great place to make friends. 2. What should I expect after I’ve signed up? The first meeting is an opportunity to explore the group and meet the other group participants. If you decide this is the group for you, you will be asked to join the group and attend regularly. If this is not the group for you, you may explore options with other groups. 3. When do SpiritGroups begin and end? With the exception of the Heart of Unity group on Sunday mornings, SpiritGroup sessions last for one session (10 weeks) in the spring and fall. Winter Groups begin the end of January. Fall groups begin in September. Some groups choose to meet during the time between sessions. 4. How often do groups meet? 5. Where will my group be meeting? Usually in the leader’s home. You will be notified if it is at another location. Each group makes its own decisions concerning childcare. Some groups may welcome children. 7. Can I sign up anytime during the session? There will be three weeks of sign-up opportunities prior to the launch of the session. Some groups choose to be closed during the session. Some are open to visitors. 8. Will the same SpiritGroups be offered each session? Groups sometimes change from one session to the other, but all groups offer an approved curriculum for study each session. 9. How will I know which group is right for me? Attend our SpiritGroup Sunday to meet the Group Leaders and find out what curriculum will be studied. Ask questions and attend the meeting launch of the group you choose.